History Suggests That Designing A New Boot Is A Multi-Million Dollar Gamble. Just the molds for a plastic shell boot cost a million dollars, and that doesn’t include engineering costs and other expenses. Then there is the need to make it profitable when annual manufacturing runs are in the thousands, not hundreds of thousands or millions. 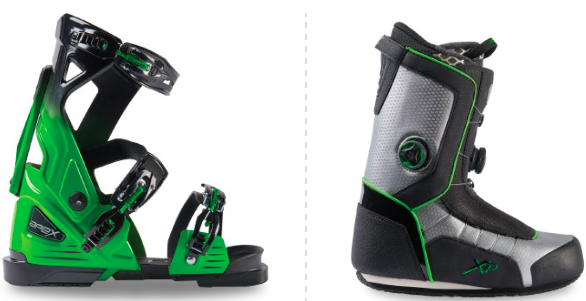 APEX Ski Boot combines a removable Open Chassis with a walkable boot. These and other factors make starting with a clean sheet a risky proposition unless the new boot idea doesn’t require huge investment in molds and boot making equipment. When Apex began designing its new boot, it had two goals: 1) optimize the boot for the modern shaped ski; 2) minimize the investment needed to bring the boot to market. According to Roger Neiley, Co-Founder and VP of Product for Apex, the company created a chassis optimized for lateral stiffness. When buckled, it provides enough forward resistance (stiffness) to help control the tips of the ski. Laterally (edge to edge), the material is much stiffer than conventional boots. Apex’s second innovation is a separate inner ‘walking boot’ designed to fit snugly into the chassis. The advantage is that the wearer can unbuckle the walking boot from the chassis while it is still in the binding. The bottom of the walking boot has a Vibram sole that allows sure-footed walking. As a senior skier, think about how much easier it will be to walk up and down the stairs to the restroom that is inevitably on a different floor! From a manufacturing standpoint, Apex has three advantages. First, it can easily upgrade or redesign the walking boot. Second, the chassis can be modified separately from the walking boot. Third, only one element (a structural ‘bridge’) has to be molded in each size. Net net, the chassis and the walking boot are two different designs that become integrated when the boot is in the chassis and the buckles tightened. I haven’t skied the Apex boot, but from reading reviews, those who like the premium priced boot, like it a lot. If you want to know more about the Apex Ski Boot, visit the company website – www.apexskiboots.com. You’ll find that the boot is widely available at ski shops around the country. 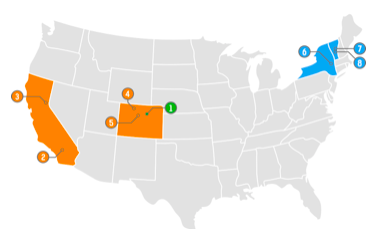 Better yet, if you’re near one of the company’s fourteen demo centers stop in and tell them you’re a SeniorsSkiing.com subscriber. They’ll waive the $25 per day demo fee. For a list of demo centers, click on this link https://www.apexskiboots.com/where-to-try-buy/demo-centers. Marc Liebman is a retired business executive and naval officer/Naval Aviator who in his deep dark past was an Associate Editor of SKI Magazine and a certified ski instructor. He is also is the author of six novels. Try before you buy and get a good fit from a demo center. I tried these in January. Though very comfortable, I could never get them snug enough around my lower calf and shin to get the same control I immediately had when I switched back to a standard boot. Apex became aware of this problem and solved that with their new XP Antero that was introduced fall of 2018. Apex repositioned the BOA’s laces higher up on the boots. They now fit snugger around my lower calf than my old conventional boots ever did. I haven’t demoed them but tried them on. The fit wasn’t perfect but I understand they heat-mold them to your foot. Does anyone have a feel for how much the heat actually changes the shape of the boot? I feel I would need a fair amount of change, but would hate to get it done, only to learn it isn’t enough. When I tried them on, support didn’t seem to be a problem, only the shape of the boot. I also understand they are warm. Any comments on that? I have owned a pair of the MC3 model for two and a half seasons and have over 80 days on them. Heat molding the liners have not made any difference from just letting your foot warm up in them. I also found the liners to be very soft and can feel the BOA cables at the insides of my ankle bones. The new liners are about the same density as mine. The heel slippage seems to be a constant as is the lack of a full feel fit at the shins. My ski shop has tried a million things to make them fit better. The solution as it turned out was to put in a better quality and a firmer liner. With 5 days on these they seem to have solved the problems. Time will tell. I think the Apex boot is a fine boot for those who have had issues getting a ski boot to fit their feet. Some of us have feet that have some serious issues (huge bunions, crooked toes) as well as very athletic calves. They do sell at a premium price. We had them in our shop several years ago and it seemed the price put some people off. I haven’t seen that many of the Apex boots where I ski in Colorado. I really wanted to love the Apex system when I got a pair, but ultimately I decided they were not for me as there were too many compromises to be made in the pursuit of comfort and warmth. They are heavy and bulky. Good for cruising the groomers but definitely a disadvantage off piste or in the.bumps. Even with the stiffest spine installed, there was still a vagueness in response. And while the boa cable system applies fairly even pressue to wrap the walking boot around the foot, it also prevents making adjustments to eliminate heel lift. On the plus side, the boots are warm and comfortable, and could work very well for someone who prioritizes comfort and walking convenience over high performance. I’ve had my Apex boots for three years now. I just came back from Steamboat – 3 months short of my 73 birthday. I learned to ski at Mount Snow 43 years ago. I also had Hanson boots way back then. Among others too painful to talk about (like my first boots – Rosemounts). In the 40 some -odd years I’ve skied, the Apex MC X boots are the most comfortable, skiable, and warmest I’ve ever had. Am I a great skier? No. But at 73, knowing I can get up and down a mountain (avoiding bumps) is what counts. One thing I have learned over the forty plus years, no matter how good some equipment is, there will always be snipers picking out what is wrong. What I know is that if I had these Apex boots, my Atomic Arc skis, my waterproof and windproof clothes, and my heated gloves, I’d be a far better skier today! The Antero model is fine for my fun skiing. That includes eastern cruisers, steeps and occasional dives into medium glades. I’m 71 and my peripheral neuropathy isn’t getting any better, but the Apex boot has solved a problem that threatened skiing, a pastime that I love. The cost is high and qualifies me for inclusion as an “addict”. O.K., I am.